In late January of this year (2012) Gill and I, along with our friends Liz and Robin, went on a two-week tour of Egypt, which involved a seven-day cruise on the Nile from Luxor to Aswan and back, a four-day cruise on Lake Nasser, and three days in Cairo. Because of the recent political upheavals in Egypt its tourism has been severely affected, which meant that although we were more strenuously harassed by the local touts who congregate at every ancient temple or tomb, we did enjoy the pleasure of having a few luxurious riverboats virtually to ourselves. Especially so on the recently flooded Lake Nasser, where many temples were relocated to higher ground before the Nile's High Dam was finally finished. The most famous of these temples is Abu Simbel, but having by now grown a little weary of Ramesses II's structural megalomania, it was the small lakeside temples in Nubia's colourful desert that were most memorable, so silent and solemn beneath the pristine blue vault of a sky without vapor-trails. The Cairo Museum is amazing. One could easily spend days here and learn so much, as the basics of Egyptian hieroglyphs are relatively not that difficult to decipher. And here again we had the luxury of being able to admire the Treasures of Tutankhamen with hardly anyone else being around, although I did get told off a few times for getting too close to the glass cases. Amongst young Tut's many artifacts are his faded silk underpants, now hung up for all and sundry to see, and the only item in the entire history of ancient Egypt that are known to have been imported from China. I was also amazed to see how closely the cloisonné work on many of Tut's attributes, fashioned from gold wire and enamels made of gemstone-paste, resembled that of China. But it seems that these ancient cloisonné techniques only reached China around the 14th century AD, which reveals much about the technical ingenuity of early Egyptian civilization. Paradoxically virtually all of the replicated resin statues of gods, pharoahs, sphinxs and pyramids that are sold in Egypt's tourist markets are now made in China. One of the most impressive sites we visited was the little known tomb of Princess Idut at Sakkara (Saqqara), located to the south of Cairo near the oldest 'Stepped pyramid' of ancient Egypt. Princess Idut died around 2360 BC and was interred beneath her mortuary chapel in a monumental stone tomb within this first royal 'city of the dead'. This date coincides with the time when the first stones were erected at Stonehenge in England, which have recently been radiocarbon dated to between 2400-2200 BC. Idut's tomb was discovered in the 1920's, and it appears she inherited the tomb because of a punishment meted out to an adulterous nobleman named Ihy. This nobleman had spent years preparing this lavishly decorated tomb for his own final resting place, but is seems that Princess Idut had somehow cunningly managed to legally secure this tomb for herself instead. What is most intriguing about Idut's tomb or 'mastaba' are the realistic scenes and vivid depictions of animals, offerings, hunting, fishing, sacrifice, and everyday life in ancient Egypt, which were skilfully carved and painted around 4360 years ago. 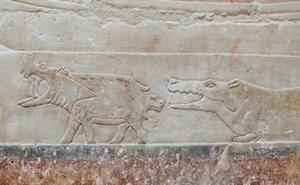 A lower frieze on one wall shows fishing boats on the Nile, with fishermen using hooked lines, fishing nets and spears to catch the various species of fish that were found in this river. One fisherman sits in the bow of his boat holding a multiple-hooked line and a wooden club to strike the fish, while in front of him is a basket filled with freshly caught fish. A row of horned bulls and a mooing cow are shown being steered across the river, with a fisherman pulling the cow's frightened calf into his boat. Crocodiles and fighting hippopotamuses are also depicted in the river, and a separate scene depicts a female hippo giving birth whilst a crocodile lurks behind with open jaws waiting to devour this newborn baby hippo. Another frieze depicts boatmen carrying various sacrificial animals, lotuses and captured water birds. A panel at the centre of the wall shows a butterfly, two ducks and an egret standing upon lotuses, with a goose, dove, vulture, and ibis nesting upon their eggs. Above on lotus stalks are a mongoose and a fox with a baby duck in its mouth that it has just stolen from a nest. Other friezes depict men carrying baskets and trays of food offerings, such as breads, beer, meats, fruits and grains; and tethered animals, such as sheep, goats, birds and cattle. One unusual frieze depicts two kneeling tax-officer scribes, who write the accounts of a tax offender on their tablets. They both have spare styluses behind their ears and their office equipment with its red and black ink containers appears on the tables before them. The offender is being dragged forward by another tax-officer, with his left hand bound to his right shoulder. But perhaps the most graphic scenes on the wall are those depicting the gruesome techniques that butchers used to slaughter sacrificial cattle. This method involved tying a rope around the foreleg of a bull or cow and wrestling the creature onto its back. The creature's other three legs would then be tied together before its upper foreleg was severed with a sharp cleaver. Apparently its throat was usually first slit and its blood collected before its foreleg was severed, but this is not shown in these images and the animals appear to be still alive. Groups of three butchers are shown performing this ritual sacrifice, with one holding the rope and tied hooves with his hands and feet, another holding the raised foreleg, and a third wielding the flint cleaver, which is also shown being sharpened with a stone.